If you are looking for a used Toyota Corolla in Guelph, Cambridge and surrounding area, the Milburn Auto Sales sales team will be able to satisfy your needs. Milburn Auto Sales always has a great selection of pre-owned Toyota Corolla in stock and add to the vehicle inventory daily. 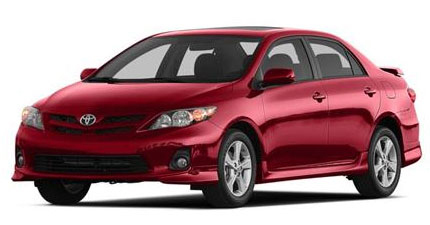 At Milburn Auto Sales we proudly sell and service used Toyota Corolla to customers from Guelph, Cambridge, Kitchener, Milton, Waterloo, Hamilton, Brantford, Elora, Fergus and the Southern Ontario Region. The Toyota Corolla is a practical sedan with a solid reputation, and gets excellent fuel mileage. For 2011 it's more basic, with just three models. The Corolla's ride, handling and automatic transmission are not without weaknesses. In the third year of this generation, competition has zoomed past, notably the new Chevy Cruze, Ford Focus and Volkswagen Jetta. G.R. Whale filed this report to NewCarTestDrive.com from Los Angeles; Sam Moses contributed to this report after his test drive of a Corolla S in Oregon's Columbia River Gorge. Source Chrome Data. No matter the model, the Toyota Corolla is a hop-in-and-go kind of car. -- New Car Test Drive....we think that the Corolla is still worthy of consideration, simply because it's so dependable and well rounded. It's also an easy and comfortable car to drive--keeping in mind that it has never been intended for an enthusiast audience. -- Automobile. Source Chrome Data.